Paved asphalt and recycled asphalt driveways for homeowners and individuals. There’s likely no stretch of road you travel more frequently than your driveway. And because of that, wear and tear can add up quickly. Though many of our paving projects cover hundreds of miles, some of our customers just need a hundred feet. Yes, Basic Construction Company can help you with driveways. Gravel, concrete, and dirt driveways all have their unique share of issues. If you are tired of dealing with potholes, cracks, or muddy shoes every morning when you head out to your car, maybe it’s time to consider getting a free quote for an asphalt driveway. Let’s start by talking a little about asphalt, our favorite construction material. If you’ve never seen an asphalt road being built, the asphalt road surface comes out of a paving machine as a hot, thick, gooey sheet. However, as it cools and we run our steamrollers over it again and again, it hardens. But unlike concrete, asphalt doesn’t harden into a dry, hard-as-a-rock substance. Once cooled, an asphalt driveway is “hard” but still a wee bit flexible. Therefore, it can expand and contract with temperature changes over many years without cracking. The flexibility also allows the driveway to mesh with changes in the soil beneath without easily cracking. 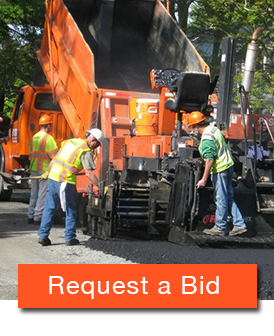 Another advantage of asphalt driveways is the cost. Typically, asphalt driveways are more cost-effective than concrete driveways. Then, you also get the long-term cost benefits of fewer issues with cracks and cheaper repair solutions down the road, should an issue arise. Since 1915, Basic Construction Co. has been the go-to contractor for driveways and other residential paving projects in Eastern Virginia. We have the experience, capability, equipment, and personnel you require for any of your driveway or driveway repair needs. Call (757) 249-3789 or contact us to discuss your new driveway today. Find out more about recycled asphalt, an environmentally-friendly material that is a great option for residential driveway construction.